We have been spending time making sure our critters are extra comfortable. I spread a fresh bale of hay in the goats’ indoor pen so they could cuddle down together in a nest. And when it is getting dark, I shut the door so the wind won’t blow on them at night. The chicken coop is all spread with a thick layer of fresh wood shavings as it’s so cold the wood won’t get damp a bit. And I closed up a couple of air vents. The chickens sure don’t need more fresh air now! Will screwed a few new sheets of plywood over the west side of the run-in shed to stop the wind for the cows and horses. (Our donkeys ate the last sheets!) Yep, I’ve tried hot pepper, anti-chewing sprays, bitter apple, and they still chew. It’s not like they’re bored or don’t have anything else to eat. Will hauled down three more big round bales to row up in a windbreak in the pasture so the stock can eat while standing out of the wind. I fed our birds extra sunflower seeds and suet as those little guys sure need extra calories when it’s so bitter cold. Then we added extra wood to the wood stoves and settled in for the evening. I have to smile — We’re working puzzles again and in the latest issue of BHM, there’s that picture of my late husband, Bob and son, David, doing a puzzle back in Montana. Yep, we still choose that low-tech form of entertainment. But I must say, the one we’re working now is the toughest one I’ve ever done! 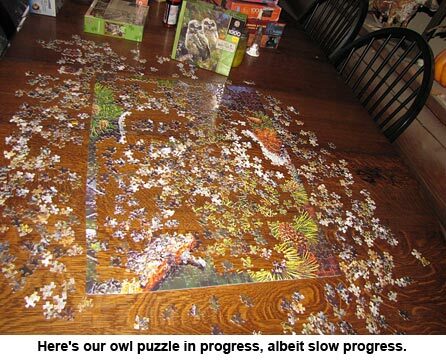 I sure hope it gets done by Christmas as it’s on our dining room table. 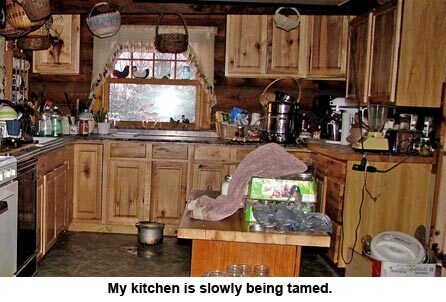 In my “spare time” I even got the kitchen cleaned up somewhat after all the fall and early winter canning. I want to get some more chili and hamburger canned up as our beef is getting a little old and I don’t want it to freezer burn. Besides, I’m running a little low on canned chili, and we sure love it — especially in cold weather. Then there’s beans to can up, which we also love as it’s so convenient. See, I’m not done canning yet — I don’t think I ever am, really. Hello, Jackie and Will. If your puzzle is not done before you need your table, just put a tablecloth over it, with perhaps a sheet of cardboard underneath for added protection. I enjoy your column and am starting to collect your books – have all your new novels. Take care and stay healthy. Love jig saw puzzles! Your kitchen looks so lovely Miss Jackie. Jackie and Will, Glad you’re finding time to relax and catch up on those endless chores. Thank you for the update. Stay warm!